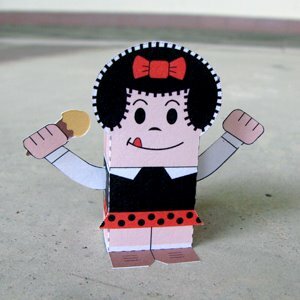 This paper toy is Nancy (Nancy Ritz), based on the same named comic strip Nancy, the papercraft is designed by Toy a Day. Nancy Ritz is a typical and somewhat mischievous young girl. She encourages Sluggo to improve himself and is instantly jealous of any other girls who pay him attention. Her best friend is Sluggo Smith.